Velina Minkoff holds a BA in English from UCLA with a track in Creative Writing – Fiction, and an MA in European Studies from the University of Amsterdam with a track in European Culture and History. Born into a family of literary translators, she translated into Bulgarian The Love Machine by Jaqueline Susann (Colibri, 1992) while still a student at the English Language School in Sofia, followed by Jacintha by Kathleen Winsor (Bard, 1993). As a student in California, Velina translated into English “alien of extraordinary ability” immigration cases for Bulgarian artists in the animation, film and music industries. 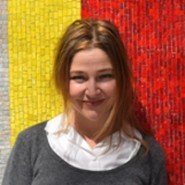 During her graduate studies in the Netherlands, she edited the English translation from Bosnian-Croatian-Serbian of war documents for the Office of the Prosecutor at the ICTY in The Hague. She also translated into English the film subtitles of Letter to America (Bulgaria, 2001) by director Iglika Trifonova, for its screening at the Leeuwarden Noordelijk Film Festival, where it won the grand prize of the jury. A member of the Bulgarian Translators’ Union Literary Section since 2012, Velina was selected as a participant in the Translators’ Atelier Workshop of the Elizabeth Kostova Foundation for four consecutive years. In 2015, she translated into English What We Don’t Know About Love by bestselling author Milena Dinkova-Rodriguez (Colibri, 2015). In 2016, Velina was awarded the one-month literary translators’ residency fellowship of the Elizabeth Kostova Foundation at Open Letter Books (University of Rochester, US) for her translation into English of an excerpt from the novel Greek Coffee by Katerina Hapsali (Colibri, 2015). Velina Minkoff teaches English in Paris, and is currently working on the translation of her short story collection Red Shorts (originally in English, Colibri, 2001) and that of her debut novel The Red and Blue Report of the Green Amoeba (originally in Bulgarian, Colibri, 2015).